Blunts + Moore’s opening was a success for Oakland’s equity program. Recreational use of marijuana became legal in California on Jan. 1, 2018, but for those who missed that day's celebrations, Apr. 20, 2018 came to symbolize the historic end of prohibition. In the year since full legalization, the Bay Area has seen positive, negative and, often surprising developments. And as a new 4/20 approaches, industry insiders are conflicted about life after legalization. Anthony Childs of Oaksterdam University believes the situation is actually worse today. "You've got regulation, packaging, testing, and the rules are constantly changing," he said. "People are losing money trying to keep up. Take packaging, for example: In January they say 'adult use,' and we get sales going along. Then July comes around, and prescription labels must be placed on all the packaging. All the product that people had been selling had to be discarded because product goes stale during that turn-around. That's a major loss of inventory, and a major blow for businesses, especially minority-owned ones who were financially disadvantaged in the first place. I'm glad Oakland has an Equity Program. It's good to see they're giving individuals who have been affected the opportunity to be proactive in their communities. Blunts + Moore give me some hope for that." In 2017, before legalization passed, former Oakland Councilmember Desley Brooks successfully orchestrated changes to the marijuana permit process designed to ensure that half of all marijuana permits be given to individuals who had been convicted of marijuana-related offenses or lived in financially disadvantaged communities. This so-called Equity Program also encouraged general permit applicants to partner with equity applicants and provide either free rent or real estate to enhance their chances of obtaining a permit. But while the program did bring hope to many victims of the War on Drugs, its implementation has become a frustrating process. "We're trying to get licenses; we're trying to get permits," Childs said. "But they have the buildings, and none of them seem to be for us. ... The equity program was supposed to benefit both established businesses and us by allowing us to help them. It's not like that." Kianna Gillis at Blum on West Grand has seen some positive changes. "We've started to see more families coming in — mothers and sons, fathers and daughters — who are more interested in what THC can do for them medically," she said. "CBD has become one of your top sellers now." Yet while Blum had gained a reputation for having one of Oakland's best 420 celebrations, this year it's not having a gathering at all. "The 420 celebration now requires a lot more than before," Gillis said. "More organization, more permits, more money. There are more rules and regulations, like on-site consumption permits, that the management has decided to forgo a full-celebration this year." Though Blum appears to be thriving, life after legalization has brought its own set of problems. "Taxes are ridiculous," Gillis said. "Right now, there's a 35 percent tax on recreational and a 30 percent tax on medical, but that's dependent on the quantity you buy. You can buy an eighth or a quarter and get the standard tax line, but if you go up to a higher increment, your tax is going to be almost the price of an eighth. ... The rules and regulations are choking us out and giving a boost to the black market." Consequently, the black market is still flourishing. "Right now, the underground markets are having good days because no one in their right mind wants to pay tax on their medicine," said Jeff Jones, executive director of the Patient ID Center. "Many have returned to their underground suppliers simply because the tax is a bit too high. Right now, demand outstrips supply, but the prices will be coming down soon because we now have regulated growing in the state. We're about to yield ten-fold of what we've been able to do before." "Legalization has been bad for some people because the marketplace for farms has shifted, so the little farmers are being squeezed out because the price-per-pound is dropping," Jones said. "It's bad for some consumers, at the moment, because prices went up when taxes were incorporated, but looking at the larger picture, it's all good. We're not criminals anymore. Nobody who touches the stuff will lose their kids. We're rolling a back a prohibition era law that I was told would never happen." Jones is both encouraged and discouraged by the Equity Program. "It's a great idea, but the implementation has been terrible," he said. "The requirements are that you have to be low-income and had to have a felony. The city would set you up in a business with no training on how to run it. They provided low-to-no interest loans when grants would have been more effective." 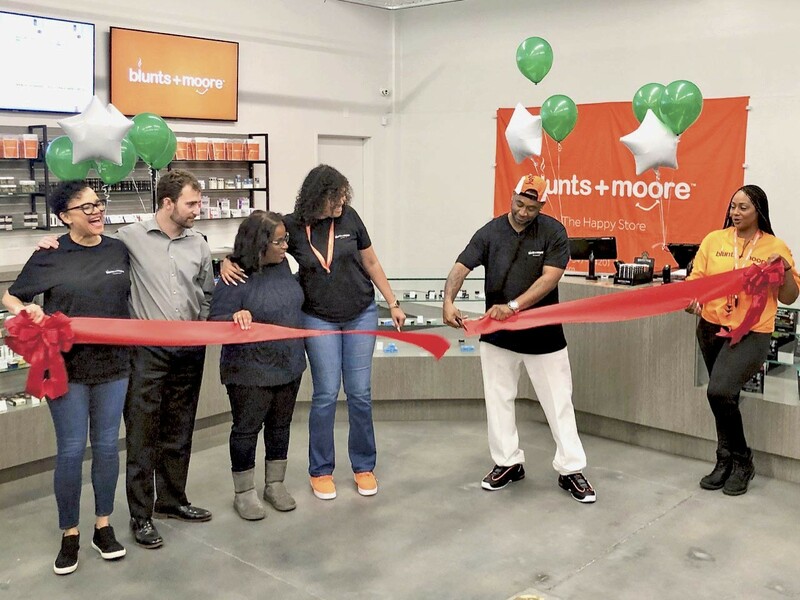 All eyes are on East Oakland's Blunts + Moore because Alphonso T. Blunt, Jr. and Brittany Moore were the first entrepreneurs to open a dispensary under the program, opening their doors in December, 2018. "Most of my career was spent as an operations manager at Morgan Stanley Investment Firm, and my mom was a senior paralegal at a cannabis business law firm that specialized in building the business structures for canna-businesses," Moore said. "We were watching TV and saw Desley Brooks on Vice. She was mentioning that she wanted African Americans to have an opportunity to have ownership. We got in touch with her, really just to shake her hand. What was meant to be a five-minute conversation became a three-day-long situation. We had to cancel our flight back because she invited us to help her push the initiative and help her craft the legislation. Once the program passed, we needed an equity applicant, and it was this young man who fit the bill, and his last name was Blunt, so I felt like he was someone I needed to meet, and did." Blunt is a graduate of Oaksterdam University, a former Tesla employee, and someone who had been trying to get a dispensary off the ground since Measure Z was passed in 2004. When he heard that Moore wanted to meet with him, he was skeptical. "I was like, what they need from me?" he recalled. "I'm poor. I work at Tesla. I have kids to feed and I can't invest in anything." A friend insisted that he at least give Moore some consideration. "I got in contact with her and her mom and brought my youngest daughter when we met at Red Robin in Concord. We immediately hit it off. ... It was organic."